German has done for consonants what Hawaiian has done for vowels. Friday words! I observe belatedly that I've passed the one-year mark on this little exercise. And apparently there are still words out there that are new to me. The new-to-me word today is a problem that might be the secret shame of many: precrastination. (Which, no surprise, spell-check wants to change to procrastination.) Precrastination is defined as "the tendency to complete, or at least begin, tasks as soon as possible, even at the expense of extra physical effort," per an article in The Atlantic that discusses this tendency. More succinctly, it refers to a tendency to get something over with as soon as possible. One example of precrastination that resonates with me is just parking in the first available slot, even if it means a longer walk to the store. The word seems to have been invented in 2014, possibly for a paper in Psychological Science that studied the behavior. I saw it only this week in an ad for motorcycle gear that urged me to avoid last-minute shopping. (To my mind, they're not using pre-crastinate in its intended sense, but hey … ads.) It occurs to me that if I'm seeing a word for the first time in an advertisement, I am definitely behind the curve on that one. For etymology, I have a follow-up to last week's word, bacteria, where I wondered if we had other words in English that shared the Greek root bakter, meaning "stick." Kind of we do! 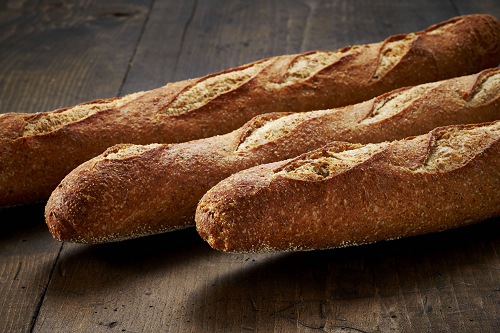 Per the folks at Merriam-Webster, baguette, the French bread characterized as a long and thin loaf, was named for its stick-like appearance. As they say, baguette ultimately comes from Latin baculum, meaning "rod." Just like bacteria.